This incredible development tool generates a complete technical documentation of applications, easily accessible by the entire development staff. iAMAnalyzer analyzes all definitions/objects included in LANSA partitions including source code for Functions, Visual LANSA Components, Web Components (Page, Visual and Script), Web pages and Web skeletons. 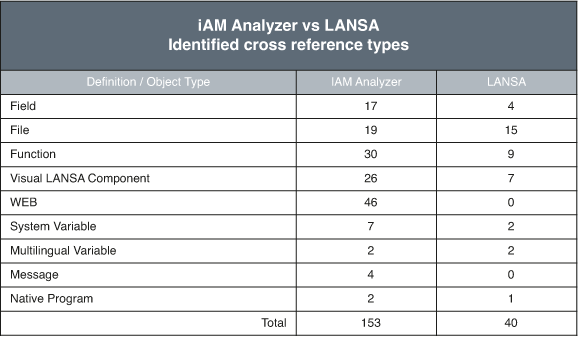 For each LANSA definition/object, iAMAnalyzer searches the LANSA repository and identifies all LANSA cross references included in the selected definition/object as well as those cross references using the selected definition/object. List of all definitions and objects the selected definition / object is using and how it accesses each of them. List of all definitions and objects using the selected definition / object and how each of them accesses it. Generating a complete technical documentation of their applications is priceless for any organization. All you have to do is install iAMAnalyzer on your iSeries and wait a couple of hours!! iAMAnalyzer automatically generates complete technical documentation of all LANSA applications for interactive visualization using a LANSA look and feel interface. iAMAnalyzer can quickly provide development team members with complete, accurate and easy-toaccess system documentation at any time. New consultants or employees are not fully productive until fully trained. iAMAnalyzer greatly reduces training time by giving new staff a tool to quickly visualize system architectures and cross-references. Using LANSA functionalities (Impact Lists, Print definitions, ...), Developers and Analysts can identify a total of 40 cross reference types. iAMAnalyzer identifies these 40 types and 113 more. When a field is selected from the LANSA Repository, iAMAnalyzer lists files, functions, Visual LANSA components, WEB components, WEB pages and WEB skeletons using the field. iAMAnalyzer even identifies which functions and Visual LANSA components are displaying the field on the screen and using the field to update files. iAMAnalyzer lists files accessing the selected file through access routes, batch control logic and lookup, as well as triggers, Dboptimize and functions using PASS_DS and RCV_DS. It also displays a list of Visual LANSA components and functions using the file and indicates which ones update the file. When a Visual LANSA component is selected from the LANSA Repository, iAMAnalyzer displays the events it is handling, the methods it is invoking from other components and a list of all referenced components. It also lists files (accessed and updated), functions called (CALL and CALL_SERVER_FUNCTION) and all the fields, multilingual and system variables, and message ids used in the component. iAMAnalyzer also lists the events the selected component is signaling and which components handle these events, the methods invoked by other components and a list of all the components referencing the selected component, including ancestor/child components. When a WEB component is selected from the LANSA Repository, iAMAnalyzer lists the fields, system and graphic variables, WEB components, WEB Pages and browse lists used in the selected component. For pages dynamically embedding components using the tag, iAMAnalyzer displays WEB components names assigned to the field in functions. iAMAnalyzer also lists functions, WEB components and WEB pages using the selected component.